The �avoidable political skirmish� between J & K Chief Minister Omar Abdullah and the state Congress, over the withdrawal of the controversial Armed Forces Special Powers Act (AFSPA), escalated on Thursday. 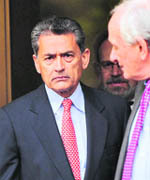 Rajat K Gupta, the Kolkota-born former director of Goldman Sachs and former global head of McKinsey & Co., on Wednesday pleaded not guilty to insider trading charges. Eight days of gruelling search operation and 149 sorties later, the IAF has managed to locate the site in Himachal Pradesh�s Lahaul Valley where the ill-fated MiG-29 fighter aircraft had crashed on October 19. The fate of the pilot, however, is still unknown. Pakistan President Asif Ali Zardari, it seems, has perfected the art of receiving gifts and that too expensive ones. Zardari has set a new record within a year of assuming the presidency by taking one-third of all the expensive gifts presented to all Pakistani Presidents and Prime Ministers, the government informed a Senate panel on Cabinet division. Teething problems were evident at India�s new Buddh International circuit as the drivers arrived on Thursday but Formula One�s main man declared himself satisfied. �Super. 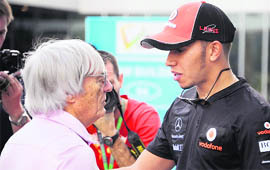 The track is super,� commercial supremo Bernie Ecclestone told Reuters in the paddock as teams set up their garages and workmen busied themselves painting markings in the pit lane. The Indo-US nuclear deal had virtually collapsed as Secretary of State Condoleezza Rice told President George W Bush it was not going to work and the entire administration had given up on it. Like selling the proverbial coal to Newcastle or Scotch whisky to Scotland, an English company is exporting UK-made tandoori clay ovens to India.